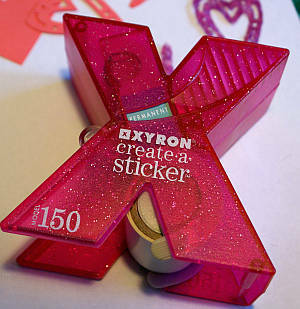 I think the Xyron 150 is a perfect tool for making stickers of delicate scrapbook and card embellishments. 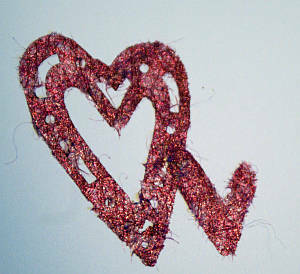 Make your own embellishments with ribbon and paper, flowers and more. Scroll down to find out a few more uses for this clever little machine. 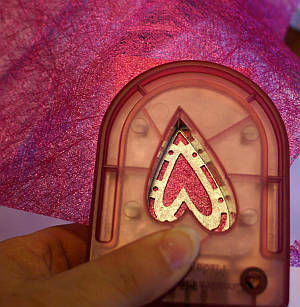 "Once I got into card making, I forgot how to tell time"
If you want to make stickers for cards and scrapbook pages, a Xyron 150 is a suitable tool to make small-ish embellishments easier to handle and adhere. You can get one of these machines from lots of craft stores and stationery supply shops. They aren't very expensive, or they weren't when I bought mine a few years ago. 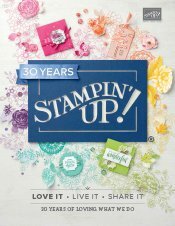 Of course, you can always use Stampin' Up!s Multipurpose Adhesive Sheets (item no 120805) in your Big Shot machine as well. This is great for making bigger stickers and making adhesive backings for fabrics too. 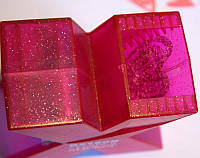 To glue down such delicate materials can be a hassle. 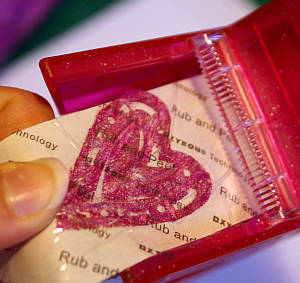 Some glues will cause the item to shrink and curl, some will not be clear when dried, some will be pretty messy to use. 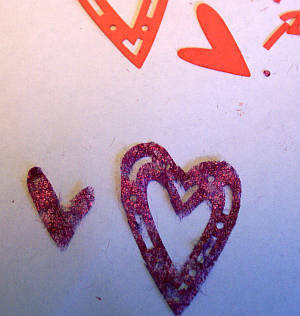 You could use a glue pen like the one from Stampin' Up! but another way to flatten the item out and make it easier to handle and completely adherable (is that a word?) is to use the Xyron machine to make it into a sticker. Now find the end of the roll of tape in the bottom of the tool and give it a steady pull to allow the shape to be fed through the middle of the machine. Adjust the item to ensure it feeds through straight. Mine managed to creep a little to one side but it still turned out OK.
Now tear the tape off just as though it were a sticky tape dispenser. The next step is to rub the item to ensure all the backing has adhesive on it. Use the back of your fingernail, a bone folder, a flower shaping tool or the back of a spoon to rub over the embellishment firmly. 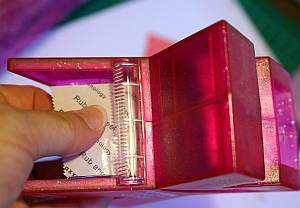 See how it even says to do that on the clear layer of adhesive tape? 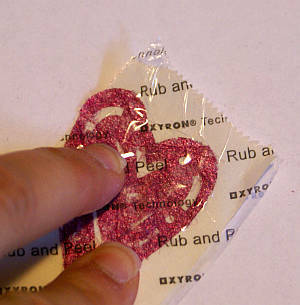 Now peel up the clear layer of tape and discard it. 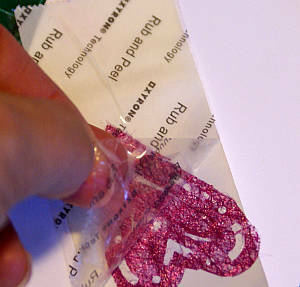 Finally, peel up your new sticker embellishment and adhere it to your card or scrapbook page. There are a few more ideas and larger Xyron machines at Hub Pages.